Structure for Architects: A Case Study in Steel, Wood, and Reinforced Concrete Design is a sequel to the authors’ first text, Structure for Architects: A Primer emphasizing the conceptual understanding of structural design in simple language and terms. This book focuses on structural principles applied to the design of typical structures—a beam, a girder, and a column—in a diagrammatic frame building. Through the application of a single case study across three key materials, the book illustrates the theory, principles, and process of structural design. The case study progresses step by step for each material, from determining tributary areas and loads through to the selection and design. The book addresses the frequent disparity between the way architects and engineers perceive and process information, with engineers focusing on technical aspects and architects focusing on visual concepts. 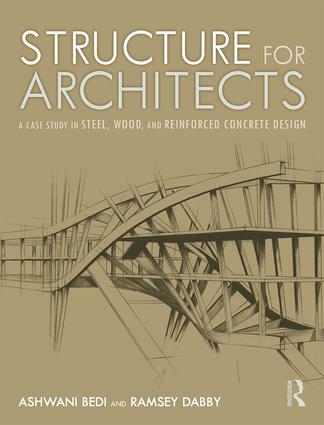 Structure for Architects: A Case Study in Steel, Wood, and Reinforced Concrete Design presents readers with an understanding of fundamental engineering principles through a uniquely thematic case study. Focusing on the conceptual understanding of structural design, this book will be of interest to architecture students and professionals looking to understand the application of structural principles in relation to steel, wood, and concrete design. "Structure for Architects - A Case Study in Steel, Wood, and Reinforced Concrete Design is a descriptive and well organized text that outlines the basics of structural design. I was pleasantly surprised by the impact of the illustrations and their ability to reinforce the content of each chapter. The case studies show the application of theory and serve as a guide for general design principles. It is a fantastic tool for introducing architects to the world of structural design." "The authors have succeeded in presenting an excellent resource for understanding the fundamental principles of structural engineering that serves to benefit both practicing architects and architectural students as well as providing a refresher for more experienced engineers. As technological advancements have moved our profession to an increased reliance on computerized solutions to complex structural problems, it is important to maintain touch with basic engineering concepts as applied to the design of steel, wood, and reinforced concrete framing. This reference book provides a firm platform for achievement of that result." "This work represents an impressive, well thought-out, concise and simplified approach to structural design. The break-out of simplified load diagrams, appropriate formulae, their application, and material studies, allow for ease or understanding and retention. This book should be owned by every architectural student, intern and practicing architect." "The case studies illustrate a workflow and parametric thinking that integrates design, structure and materials. It is a valuable tool for Architects to analyse and solve problems methodically." "Structures for Architects offers a comprehensive overview on the principles of design for three major structural materials: steel, wood and reinforced concrete. The content is presented in a clear, intuitive and visual manner, and includes valuable case studies that help illustrate and enhance the concepts. An excellent reference and teaching tool for students of architecture." "This volume builds on the authors' previous Primer to provide a valuable and engaging set of texts for teaching structures for architecture students. The endeavor has been informed by years of classroom experience, a passion for the subject, and an intuitive understanding of the power of visual representations to convey structural principles. The variety and clarity of the many illustrations -- photographs, diagrams, rendered axonometrics, and especially the beautiful and tactile hand sketching -- is a great strength of the book. The authors know how to exploit the curiosity of the visual thinker and invite the type of exploration that leads to a genuine understanding." Ashwani Bedi is a Professional Engineer and Deputy Director of Engineering with the NYC Department of Design and Construction. He has over 30 years of experience in the public and private sectors, and is currently Adjunct Associate Professor at The New York City College of Technology, where he teaches Structures courses. He is also the co-author of Structure for Architects: A Primer. Ramsey Dabby is a Registered Architect having served as Chief Architect for the NYC Fire Department, and previously as Director of Engineering and Construction for the Hertz Corporation. Now retired with over 40 years' experience in the public and private sectors, he currently teaches as Adjunct Faculty in the Architectural Departments of The New York City College of Technology, The City College of New York, and The New York Institute of Technology. He is also the co-author of Structure for Architects: A Primer.